Praise the Lord, I found my scissors sharpener! After a couple weeks of cutting linen and leather my scissors were so dull they literally failed to cut thread. I have looked for the Scissors Saver four times this week. And today, at my wit’s end I was looking for something else, and found it exactly where it has always been in the sewing box. 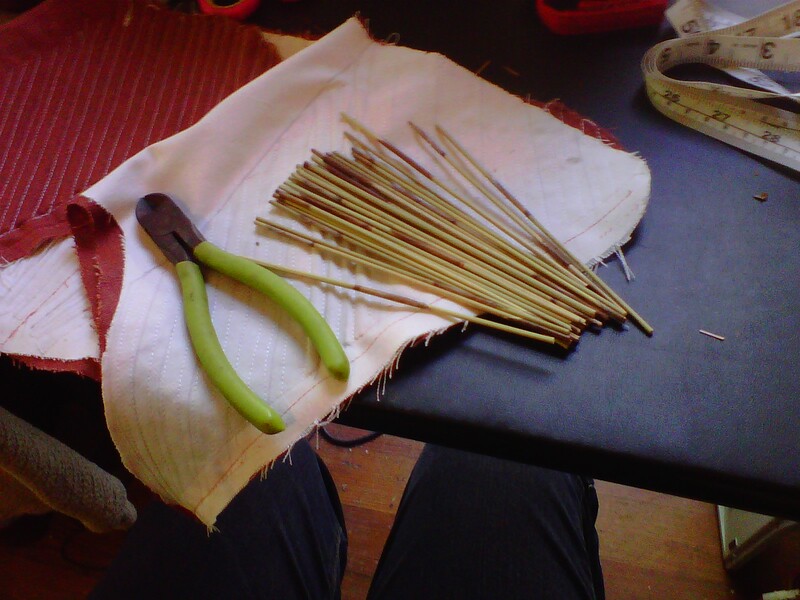 I was profoundly relieved because I was about to start cutting fabric with an exacto knife. 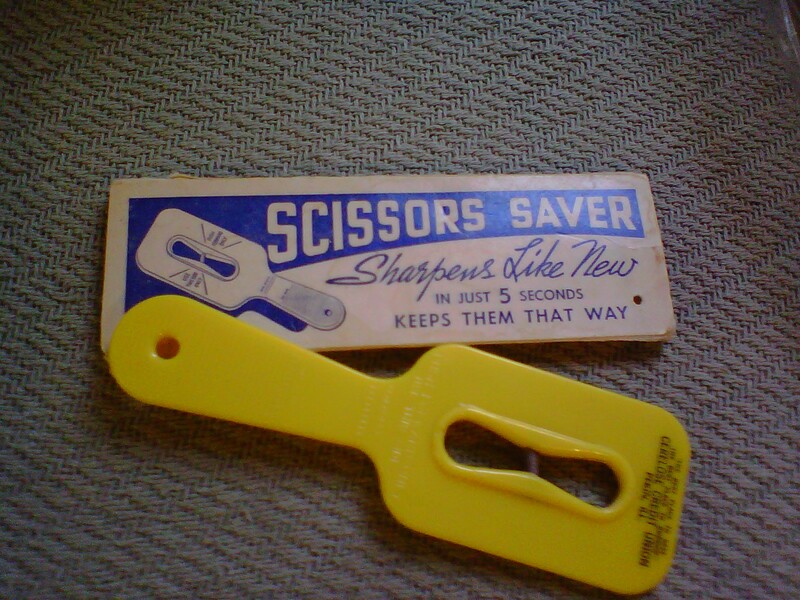 The Scissors Saver is a handy doohickey that I got out of my Great-Grandma Gosnell’s sewing box when I was 12 or so. They apparently don’t make handy sharpeners like this anymore- probably so they can sell more scissors. It’s more than just a scissor saver, it’s a lifesaver. Or at least a sanity-saver. I was working on a new bodice. You cannot have too many bodices. (Bob- your opinion does not count because you don’t have to wear a bodice. So There.) I have 2 wearable bodices, one blue and one rust colored, but they are both of the side-lacing strapless type. And I wanted something different so I am making a front-lacing type with straps. I’m using small reeds as the stiffener (Boning) and I am also trying a new technique of diagonal boning instead of vertical. Here’s a photo so you can all appreciate my prowess with linen and reeds. 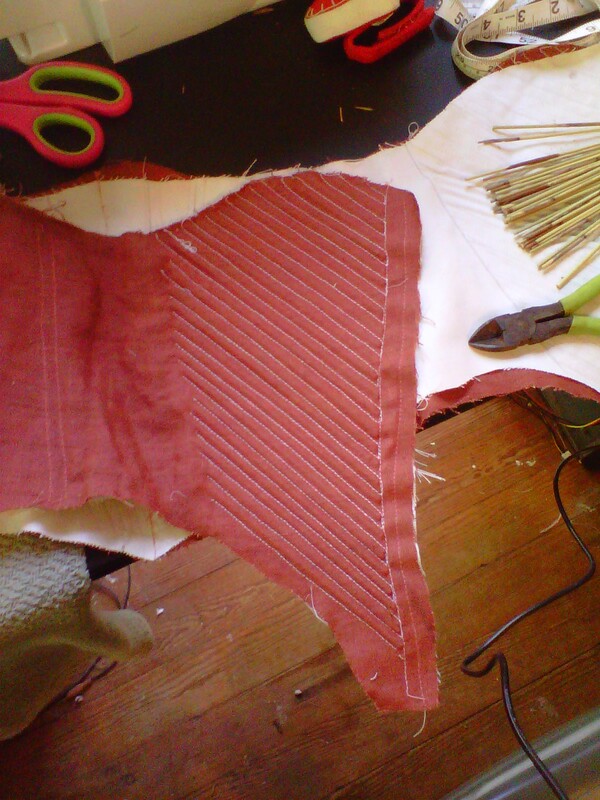 There are a lot of reeds, but not as many as the silk bodice I made that had 360* boning. This one is going to be rust linen with brown linen edging. Here you can see one side of the lining with the bones stuffed in. I finished all the machine work on the bodice. There is nothing left now but to finish the neck of Travis’ shirt. *Sigh. * That shirt is the bane of my existence this week. It should have been profoundly easy, but a combination of bad pattern, bad sewing, and dull scissors has made the project stretch on ad nauseum. I’ve finished all the pants and made myself a possibly extraneous bodice, and I still have not finished that darn shirt! At least now my scissors are sharp.